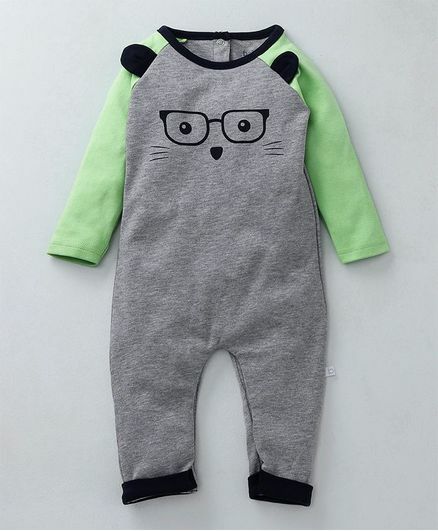 Add some style to your little one's wardrobe with this full sleeves romper brought to you by Babyoye. It has been attractively designed which makes it look voguish. Snap button opening at crotch ensures easy diaper change. Your little one will feel extremely comfortable all day long in the soft fabric of the outfit. Styling Tip: Pair it up with cap and shoes to complete the look. Babyoye 'super-cute must haves' are designed to capture the magic of childhood, making perfect memories for the cute little adventurers. These oh-so-cute pieces stand for international quality & design available at affordable prices. The brand gives utmost importance to what their customer needs; safe, comfortable & trendy products for kids.They believe that your lil' one's wardrobe should be as happy as their smile!